The Al Falah School of Medical Sciences And Research Centre has embarked on its mission of creating a state-of-art centre of Medical Education and Research. Our academic programmes are based on a multidisciplinary approach that unifies the fundamentals of medical science, clinical practices and today’s information technology tools. The Al Falah Hospital will serve the community by providing cost effective healthcare in a patient-friendly environment. There is already an inflow of lot of patients from surrounding areas because the patient care is excellent. The realization of the dream of Institute for Medical Sciences & Hospital was achieved due to clear vision of Chairperson who had a burning desire to tread on the challenging path of truth and excellence. The Mission of the Institute, which is an integral component of Al Falah University, shall be to create, uphold and develop an ideal academic environment for undergraduate and postgraduate quality medical education and research, to set a standard and safe tertiary healthcare, with all modern facilities of investigation and treatment. The aim is not only to produce doctors with a good clinical acumen, but also to inculcate in them ethics and values by which they can treat patients with a humane touch. The University has the vision for making the Institute into the best multispecialty teaching centre with the help of eminent, experienced and dedicated teachers. The teaching and learning programmes have been so designed that they will inspire the students to enrich themselves personally and professionally. 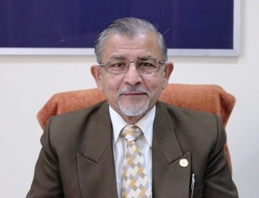 Prof. (Dr) Anil Kumar, is founder Vice Chancellor Al-Falah University since 2014. Before this he was the Director of Al-Falah School of Engineering and Technology since 2009. Earlier he was in DRDO as Director, Laser Science and Technology Centre Metcalfe House, Delhi. Dr Anil Kumar had been a first class scholar throughout his education career. He was a gold medalist graduate, and he did his Ph.D. at an early age of 23years, from University of Delhi in Microwave Physics under the supervision of renounced Prof. G P Srivastava and Prof P C Mathur of Delhi University. His Ph.D. work was published in 5 international Journal including Journal of Chemical Physics USA, IEEE transaction. In 1975, he was invited as Liverhulme Common wealth Visiting Fellow for Post Doctoral work with well-known Prof. J Sheridan at School of Physical and Molecular Sciences, University College on North Wales (now University of Bangor)UK, He made significant contribution in the field of Microwave Spectroscopy. In between during 2001-02, Dr Anil Kumar was Director (Science andTechnology) in Ministry of External Affairs on deputation from DRDO. In 2009, he joined as Directorof Al-falah School of Engineering and Technology and he helped it to become an Autonomous institute of M D University. He is also instrumental in getting the college Grade “A” by NAAC (UGC). He has later focused with his team along with the Mr J A Siddiqui Chancellor of AFU,on AFSET to become The University in 2014. Recently he has guided the university to get recognized by UGC under section 2(f) and 12(B) of UGC act 1956.
. He is a member of manyprofessional bodies including OSA, ILA, IEEE, and He is a Fellow of IETEsince the age of 37. He has been a member of many committees and as part of many Govt. delegations, travelled to US, Russia, Armenia and Israel. He has published over 85 research papers in the journals all over the world. He has been in advisory board of many national and international conferences and invited to deliver special talks. He is also referee for many journals including optices and Laser technologes(UK).